I mentioned last time that I was planning another blanket, this time for youngest hippy (13) who doesn’t wish to be left out of the equation, so we had a look at patterns (well I made him actually) and “we” chose something. 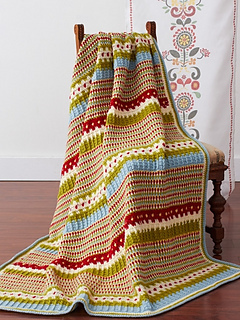 It’s a gorgeous (free) pattern from Yarnspirations – the pattern place for Paton yarn and I was so impressed I uploaded it to my Ravelry page. 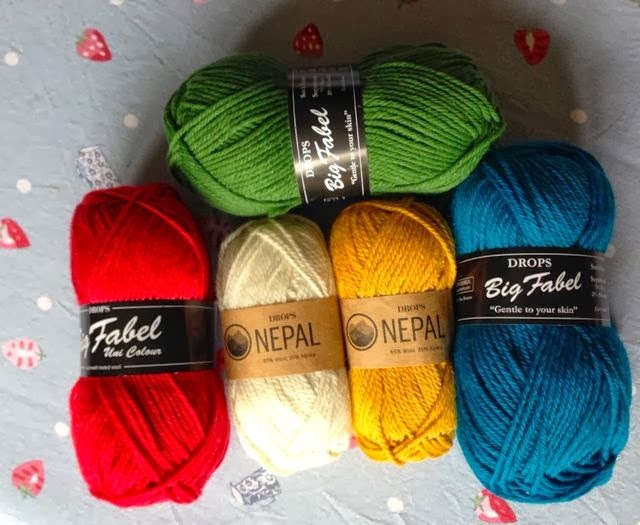 My first problem came though when I tried to source the yarn – it is available in the United States (Paton’s Decor) but I couldn’t get hold of it in the UK. So my next problem was trying to find an alternative as I wanted to keep as true to the colours as possible. I think I’ve managed it and chosen some yarns from the lovely Wool Warehouse. They are not exactly the same but I do like the combo – what do you think? As you can see from the photo, I have chosen yarn in the same weight but from two different ranges. Is this a good idea? Sometimes you can’t get all the colours you like in the same range but I did check the gauge so am assuming this will work? Any advice would be great from your experiences. Speak soon. If the washing instructions are the same and you've checked the gauge, I'd say go for it. I'm always mixing yarns and rarely have any problems.